Blue/Orange premiered at the National Theatre in 2000, and won the Olivier Award for Best New Play. The play is a three hander, and the premise is simple. Christopher, a patient, is due to be discharged the next day from a psychiatric ward, but his doctor has reservations concerning his diagnosis and his delusions. He discusses these with his Consultant, and what ensues is a power struggle between the junior and senior clinicians, in which the needs of Christopher all but disappear. Christopher is a young black man being treated by two white doctors, and at the time of the premiere, the play raised huge issues about psychiatry, diagnosis, ethnicity and the monetary cost of care. Sixteen years on, the Young Vic is staging a revival, and I went to see it with Dr Arsime Demjaha, a psychiatrist specialising in psychosis, to see what had changed. The premise of the play may be simple, but the play itself is incredibly complex, and raises a myriad of issues. The staging is spot on: as we took our seats, Dr Demjaha leaned across to me – ‘that looks exactly like my office’. (Apart from the ashtray, that is – was it really only 16 years ago when patients would routinely smoke in consultations?) As the junior psychiatrist, Bruce, enters, they’ve got him spot on too, right down to the top button undone under his tie, the precisely rolled up sleeves, and the way he wears his belt slightly down at the front, with his NHS ID clipped to one side of the belt, and a pager to the other. Luke Norris as Bruce exudes the earnestness and naivety befitting his role. The play starts and there is humour, but it’s dark. Bruce to Christopher: ‘What does alcohol do?’ Christopher to Bruce: ‘It makes your blood thin.’….. Bruce: ‘Sorted’. Christopher: ‘Sorted for Es and whiz’. Bruce… ‘Indeed’. We learn that Christopher is expecting to go home the next day, but also that Bruce isn’t entirely comfortable with that idea. Our loyalties are divided – is Christopher really so ill that he has to stay in hospital? Or is he just a little exuberant? The first diagnostic term is used: Borderline Personality Disorder, and Bruce voices his reservations about this diagnosis for the first time. Daniel Kaluuya, as Christopher, owns the stage with his reaction. In the interval I discuss this with Dr Demjaha, who is clear from the outset that Borderline Personality Disorder is a misdiagnosis, and that Christopher has psychotic symptoms and is very unwell indeed. For the rest of us, without the benefit of her psychiatric training, it takes a little longer fully to understand the extent of Christopher’s illness. The playwright Joe Penhall clearly understands psychosis and schizophrenia. I met him a week after watching the play, and asked him why he chose to write Blue/Orange. He says it was a coming together of many things. He had a friend with schizophrenia who had spiralled into alcoholism and homelessness. Alongside this Penhall spent two weeks working alongside another friend with borderline personality disorder providing support to people with schizophrenia: ‘another acute, visceral insight’. At about the same time in the early 1990s he was a reporter on the Hammersmith Guardian, regularly reporting on stories about the Care in the Community initiative. He wrote a feature about people being released too early and resources being over-stretched, but felt he couldn’t quite communicate the essence of what the story was. Blue/Orange was born out of his realisation that this subject was inherently dramatic, emotional, visceral, and something that couldn’t really be captured in a newspaper. For Penhall, Blue/Orange was a microcosm of the economic rationalisation and monetarisation he observed going on everywhere at that time, but at its worst in the mental health sector. Bizarrely another of Penhall’s projects also informed the play. While working on early drafts of a film about Idi Amin, he interviewed the Ugandan dictator’s psychiatrist, who spoke to him about Amin’s grandiose, delusional nature. Amin does make a cameo in the play, not as a character, but as one of Christopher’s delusions. Penhall had tried to write Blue/Orange several times, but his work researching Idi Amin was ‘the final piece of the puzzle’. Penhall told me he wanted to write about power, and power within the institution. Robert, the senior consultant psychiatrist, and Bruce’s boss (beautifully hammed up by David Haig), is a mechanism by which he explores this. Robert is immediately unappealing and inappropriate, ignoring Christopher and making sexual jokes about Bruce’s wife. Dr Demjaha pointed out to me that from the beginning, Christopher is invisible to Robert apart from when Robert needs him to satisfy his own ends. Although a key tenet of psychiatric treatment is patient-centred care, there is none of that on this stage. Penhall told me it wasn’t his intention to pillory psychiatry per se, and that he doesn’t believe any psychiatrist would behave like Robert, either then or now. The fact that the two doctors talk about their patient as though he isn’t there, even when he’s on the stage with them, was poetic licence, and a kind of metaphor ‘for how people are conspired against because of their lack of articulacy, and their lack of vernacular, … and their lack of privilege and their lack of education…. and they become a football… and the play is a sort of crude satire of that’. Robert veers into the absurd as he justifies discharging Christopher. It will be bad for Robert’s career, and for Bruce’s too. Robert uses spurious arguments to dismiss all of Bruce’s protestations, and then Bruce uses the second diagnostic term: schizophrenia. An interlude where they bat diagnoses backwards and forwards between them is funny, if tragic for Christopher. But then Penhall uses Robert to ratchet up the drama. Nobody likes the idea of people losing their liberty, and from the mouth of this thoroughly unlikeable man come words we want to believe: ‘if you keep him here, he won’t be able to go home because he won’t know what home is any more… treat him in the home, - he’s more comfortable, we’re more comfortable’. There’s more. We can all relate to Robert’s statement ‘we blithely assume that we know what “normal” is… maybe we’re the sick ones.’ However,Robert is clearly far from the archetypal wise psychiatrist whose understanding of humanity surpasses all others. Penhall summed it up to me eloquently: ‘he’s appropriating liberalism, a fascinating technique that was pioneered in the 90s… appropriating a seemingly liberal argument ….. that a person should be free; (appropriating liberalism) for the sake of expediency, the rationalisation, cost cutting…. it seemed like an appalling trick to me’. If Robert’s arguments ever were reasonable, they are demolished the more we see how unwell Christopher is, and the more Robert alludes to the cost of keeping him in hospital. This is where the Blue/Orange comes in. Christopher thinks that oranges are blue, even though he knows on some level that they are not. Idi Amin also makes his entrance here. Christopher discloses that he is the son of the Ugandan dictator, but is increasingly uneasy. His determination to go home wavers, and he tries to find a way to ask to stay. Robert however is having none of it. He has manipulated Bruce, is manipulating Christopher, and has manipulated the audience. Dr Demjaha pointed out to me that Robert himself becomes almost as delusional as his patient – delusional about his position, and delusional with the increasingly florid arguments he concocts to prove that he is right about Christopher, and that Bruce is wrong. Penhall says however that he wanted to demystify the popular fallacy that the mad are sane and the sane are mad. Throughout the play there is something else – an issue of ethnicity. Robert moves along the spectrum from mild cultural assumption through to ethnocentricity. How many steps from racist is he? Penhall says Robert may be ethnocentric, but he’s not racist, at least, he’s no more racist than middle England. Robert’s racism is part of his power struggle with Bruce, and Bruce’s injudicious use of the n-word is manna from heaven for Robert in that struggle. This play about hierarchical power struggles, and the place of those at the bottom of the hierarchy, has lost none of its power in the 16 years since I first saw it. What has changed I believe is that care is more patient-centred than it was. But can we say the same about power abuses within hierarchical structures? That appears still to be a work in progress. - Dr Sally Marlow is Public Engagement Fellow at the Institute of Psychiatry, Psychology and Neuroscience, King’s College London. 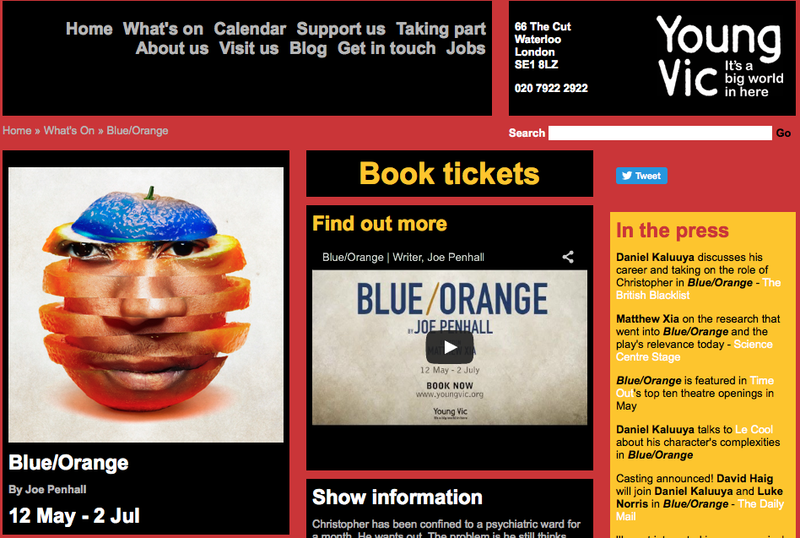 Blue/Orange is on at the Young Vic until 2 July. Bughra, D., Hilwig, M., Hossein, B. et al (1996). Firstpcontact incidence rates of schizophrenia in Trinidad and one-year follow-up. British Journal of Psychiatry, 169, 587-592. Fearon, P., Kirkbride, J.B., Morgan, C. et al (2006). Incidence of schizophrenia and other psychoses in ethnic minority groups. Psychological Medicine, 36(11), 1541–1550. Hickling, F.W. & Rodgers –Johnson, P. (1995). The incidence of first-contact schizophrenia in Jamaica. British Journal of Psychiatry, 167, 193-196. Mahy, G.E., Mallett, R., Leff, J. & Bughra, D. (1999). First-contact incidence-rate of schizophrenia in Barbados. British Journal of Psychiatry, 175, 28–33. Morgan, C., Mallett, R., Hutchinson, G. et al. (2005). Pathways to care and ethnicity. 1: Sample characteristics and compulsory admission. The British Journal of Psychiatry, 186(4), 281-289. Tortelli, A., Errazuriz, A., Croudace, T. et al. (2015). Schizophrenia and other psychotic disorders in Caribbean-born migrants and their descendants in England. Soc Psychiatry Psychiatr Epidemiol, 50(7), 1039–1055.